Best IPad Recovery Software, recovering pictures in 3 Steps! Apple products are one of the most popular and useful products among electronic market, and most people like to use it as they have powerful functions and beautiful appearance. So there is no doubt that IPad is chosen by many people. IPad Recovery Pro is concentrated in IPad retrieval. It helps you get lost photos and other multimedia files back from IPad. People have more and more electric products such as mobile phones, digital cameras, and computers. IPad is one of them. Many data, files, and pictures, games are stored in the IPad. But someday, if you delete or empty your IPad by mistake, how to undelete IPad? Do you think they are gone forever? The answer is definitely not. 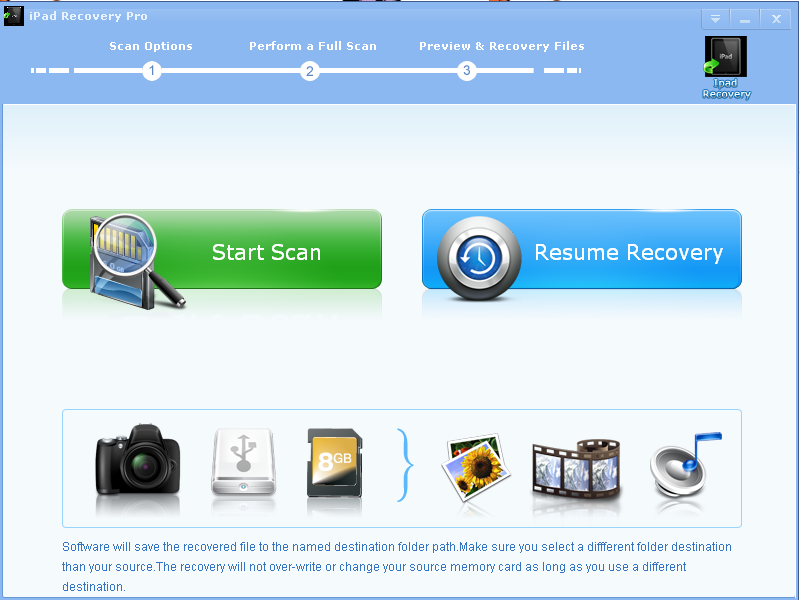 As IPad Recovery Pro is the best tool on this kind of data or pictures recovering, IPad Recovery Pro is easy-to-use. IPad recovery software can effectively retrieve deleted or lost photos, music, video, and multimedia files from almost all digital products after instances like deletion, corruption and formation, etc. It not only recovers IPad, but also many memory cards such as MicroSD (TransFlash), SDHC, miniSD card, MMC card MultiMedia card, CF card, Compact Flash card, CF Type I, Type II, MicroDrive, Memory Stick, Memory Stick Pro, Duo, Pro-HG, XC, Micro(M2), SmartMedia, flash card, XD Picture card, Mobile phone memory card, Cellular phone, digital media, USB flash drive and digital image. There are so many scenarios can lead to the lost, such as: accidental deletion events; accidental formatting or reformat; Other recoverable scenarios (Virus infection, Unexpected power off, Lost photos during transferring photos from storage devices to PC or laptop, unexpected errors during low batteries and improper digital camera turn off); People may think those flies are lost forever, but now IPad Recovery Pro will help you to undelete them no matter which scenario you are facing. You may see how powerful and magical IPad Recovery Pro tool it is! Yes, another thing you are happy to know is that IPad Recovery shareware can support many kinds of picture, audio and video formats and almost all company products such as Sony, Nikon, Canon, HP, Dell and many others famous. Another important feature is IPad Recovery Pro is easy to use. It is and always will be the first and best choice for the old and young. Simple procedure! Amazing effect! 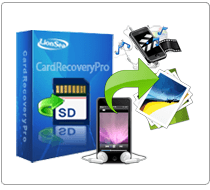 * IPad Recovery Pro will undelete all type of photos from your SD card or disk.